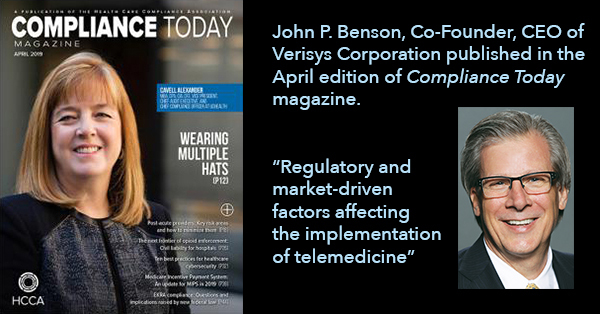 “Regulatory and market-driven factors affecting the implementation of telemedicine” – Copyright 2019 Compliance Today Magazine, a publication of the Health Care Compliance Association (HCCA). John P. Benson, CEO, Co-Founder of Verisys Corp. Roll forward to today. The consumers are driving the movement with a saturation of personal data-gathering devices that can feed secure real-time or asynchronous platforms to the largest independent telemedicine providers. We are there, gathering data on wrists and in pockets, and the tailwinds are positive from an innovation perspective, but we still have a ways to go. There remain key legislative barriers. I took note of three presentations during the 37th Annual J.P. Morgan Healthcare Conference in San Francisco, CA, on January 7, 2019. Bernard J. Tyson, Chairman and CEO of Kaiser Foundation Health Plan, presented “Delivering Health in the 21st Century.” Tyson stated that they had 77 million virtual encounters, comprising 59 percent of all encounters in a member base of 12.2 million, making Kaiser Permanente the nation’s largest integrated health system. Marc Harrison, MD and CEO of Intermountain Healthcare, the largest healthcare provider in the intermountain West, claims the lowest healthcare cost per capita (26% lower than the national average) and second highest rated system in terms of healthcare quality, based on Medicare readmission rates. It reports 13 telehealth sites offering 40+ services with 525,000 transactions in 2018. Jason Gorevic, CEO of Teladoc, one of the largest telehealth providers, reports it has 23 million paid U.S. access members, 9.4 million fee-only live visits, and 2.55 million visits estimated in 2018 (9.4% utilization), up from 1.46 million in 2017. The growth is the real story here. Teladoc  1/9 promotes that they are the first virtual care entrant that handles system entry, care, and resolution in the areas of general medical (i.e., diagnosis and treatment), mental health, surgery support, and dermatology. Videoconferencing was a more common telemedicine mode than remote patient monitoring or store-and-forward of patient data. Physicians in larger practices (50 or more) were 26.5% more likely to use it than those in smaller practices, suggesting that financial burden may continue to be a barrier to implementation, the authors said. 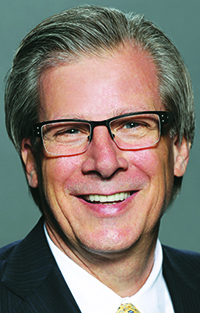 Carol K. Kane and co-author Kurt Gillis, a principal economist in the AMA’s division of Economic and Health Policy Research, promoted the notion that the financial burden of implementing telemedicine is standing in the way of small practices. Based on the number of telemedicine technology platforms in the market today, many of which are very low cost, it can be safely assumed that may have been the case in 2016, but is certainly not the case today. Once again, we are dealing with lagging data, like the federal data. And as a result, it may be safe to say that adoption is significantly higher, as evidenced by the Kaiser numbers referenced above. A reluctant but ever-growing willingness on the part of payers to embrace and reimburse for telemedicine—primarily driven by employer/employee (beneficiary) demands for opening healthcare to the on-demand economy—not because it lowers costs (it might), but because consumers are demanding the service. Forty-nine states and the District of Columbia provide reimbursement for live video telehealth services through Medicaid fee-for-service programs. Massachusetts is the only state not yet participating. Several states, including Indiana, Michigan, and Missouri, have introduced or passed legislation that expands remote prescribing of controlled substances for treatment of substance use disorders. Telehealth utilization through state Medicaid programs has expanded to allow recipients greater access, especially in schools. New York has expanded the list of state-sanctioned care delivery sites for telehealth to public, private, and charter elementary and secondary schools, and granted children virtual access to mental health counselors. The VA is expanding its telehealth-focused programs and is now mandated by Congress to provide veterans with a self-scheduling, online appointment system, whether in person or via telehealth technologies. The VA’s telehealth program now includes approximately 20,000 new patients and hosts more than 6,000 virtual visits each week. The use of telehealth services under the Medicare Physician Fee Schedule was low in 2016 (and yes, we would love to see more timely numbers from CMS), but between 2014 and 2016, telehealth visits per beneficiary increased 79%. In 2016, some 108,000 beneficiaries accounted for more than 300,000 telehealth visits that totaled $27 million in spending. The three primary barriers discussed in my prior articles published in Compliance Today magazine were coverage/reimbursement/parity, interstate licensure, and hospital credentialing. The three barriers are the same today; however, despite consistent headwinds presenting resistance in resolving issues around these three very key areas, progress is being made. 11 states have yet to pass telehealth parity laws. 9 bills are pending for demonstrations in various milieus, grants, and pilot projects. 3 bills allow for Medicaid reimbursement in Illinois, Mississippi, and Virginia. There are other pieces of legislation out that mention telemedicine, but those mentions are rationale for other funding bills, such as pushing out gigabit broadband to rural counties. The Bipartisan Budget Act of 2018, signed into law in February, expanded Medicare coverage for certain telehealth services to beneficiaries who are being treated by practitioners who participate in accountable care organizations (ACOs). In June, the CMS characterized telemedicine as a cost-effective way of providing medical care and publicly encouraged states to use telemedicine and telepsychiatry to facilitate coordinated care for Medicaid recipients. As of August 2018, 49 states and the District of Columbia provide reimbursement for live video telehealth services through Medicaid fee-for-service programs. Massachusetts is the only state not yet participating. In October President Trump signed into law the Special Registration for Telemedicine Act of 2018, requiring the Drug Enforcement Administration (DEA) to activate a special registration that allows physicians and nurse practitioners to prescribe controlled substances via telemedicine without an in-person exam. The DEA has no more than one year to complete the task. Investment funding for digital health companies reached $9.5 billion in 2018, up more than 30% over the previous year, according to Texas-based Mercom Capital Group, a communications and research firm. Of that funding, $7 billion went to US-based companies. In the summary published by Mercom Capital Group, there were 698 deals that raised $9.5 billion for digital health companies in 2018, up from $7.2 billion in venture funding for 778 deals in 2017. Total corporate funding for digital health companies, including debt and public market financing, reached $13 billion in 2018, up 58% compared to $8.2 billion in 2017. A third of the venture capital funding was raised by just 18 companies, each bringing in over $100 million in 2018; the telehealth company American Well raised $291 million. In all, the portion of venture capital-funded digital health solutions in telemedicine came to $1.14 billion in 2018. Where there is money, there are criminals. Ripped from the headlines: “Four Men and Seven Companies Indicted for Billion-Dollar Telemedicine Fraud Conspiracy, Telemedicine Company and CEO Plead Guilty in Two Fraud Schemes.” The indictment, filed in October 2018, alleged that the charged individuals and companies conspired to deceive tens of thousands of patients and more than 100 doctors across the country for the purpose of defrauding private healthcare benefit programs out of $174,000,000 and that the defendants submitted $931,000,000 in fraudulent claims for payment. HealthRight, a telehealth company, allegedly solicited insurance coverage information and prescriptions from consumers across the country for prescription pain creams and compounded products. The indictment states that doctors approved the prescriptions without knowing that the defendants were massively marking up the prices of the invalidly prescribed drugs, which the defendants then billed to private insurance carriers. This is a reminder for all compliance and anti-fraud professionals that new innovation provides opportunity for the fraudsters to seek and find vulnerabilities in any system, including the telemedicine space. As the technologies evolve in telemedicine and the investment dollars follow, this is a stark reminder that building in solid, thoughtful controls is another key to success. Systems that build trust and cannot be compromised are far more likely to gain adoption and enjoy long-term success. Allow telemedicine prescribers to apply for DEA registration numbers in multiple states at once. Without naming names, the argument that adoption is slow on the consumer side is not supported by the facts. None of the data even remotely suggest such a notion. The reluctance to providing the technology has come from the payers and some provider groups, borne out of fear that telemedicine would increase cost and diminish a provider’s importance or relevance and also lower quality metrics. The other argument, citing slow adoption on the part of the healthcare providers, whether systems or payers, is that the technology is expensive and changing so fast that it is not yet practical to implement. This is but another fallacious statement. Most telemedicine applications are well-designed apps or cloud-based systems that function efficiently and at a very low cost. Fear of innovation and new technologies should not be a barrier to achieving the goals of access, high availability, ease-of-use, cost efficiency, and proven efficacy. Healthcare moving forward is going to be about platforms that promote access and shared data, not silos created by regulatory or corporate interests or poorly predicated supposition and myth. The top three practices using telemedicine for physician-to-patient visits are radiologists, psychiatrists, and cardiologists. The financial burden of technology used in implementation of telemedicine is becoming less of a barrier, allowing smaller practices the option of using telemedicine. CMS expanded telemedicine access to Medicare Advantage enrollees in order to serve vulnerable populations. Between 2014 and 2016, telehealth visits per beneficiary increased 79%. Consumer desire that fuels competition between the choices of health systems and practices is a factor driving technology and legislation. rule, Telehealth, “Remote Evaluation of Pre-Recorded Patient Information” (HCPCS code G2010). 5 CMS.gov: Information on Medicare Telehealth. November 15, 2018. 11 116th Congress (2019-2020): Care Veterans Deserve Act of 2019 (H.R.23). Telemedicine Prescribing of Controlled Substances” Health Care Law Today, March 5, 2018.